I tried out Mineral Fusion nail polish. I picked it up at Whole Foods. There were a lot of colors to choose from, but for some reason I’ve been into shades of brown this Autumn. This nail polish is free of the big 3 toxic chemicals, Dibutyl phyhalate, Toluene and Formaldehyde. I don’t generally look for nail polish that’s free of these, although the majority of the brands I buy already are. I don’t know why the formaldehyde part concerns me… maybe because it’s associated with dead bodies. In any case, the nail polish applies smoothly in a thin layer. I did two coats and a top coat, but thought maybe three coats would have been nicer. So far it’s wearing pretty well, but I haven’t had it on that long. It was $7.99 a bottle. That’s comparable to most of the other brands I buy. I absolutely love the color. I honestly didn’t expect to love it so much. Would I buy this brand again? Absolutely! Edit: …and already I bought another bottle. I am an addict!!! LOVE this!!!! 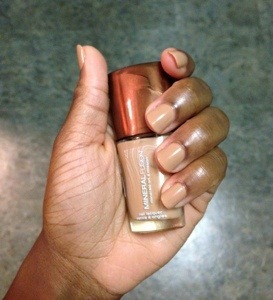 If I wore nail polish, this is the type of neutral I would wear on my fingernails! I may have to pick that up for my toes. Totally love it! Me tooooo! I sooooo didn’t expect to love the color this much. Usually cream colors (as opposed to shimmer colors) don’t apply well on my nails. This one is perfect! I am a nail tech use this on my clients they love it.